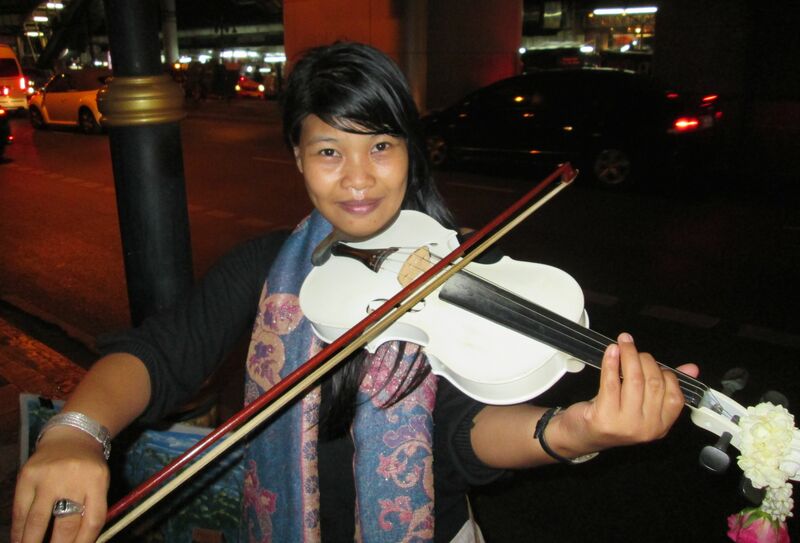 Even if she wasn’t playing Western pop tunes or sad Thai love sonnets, the woman would stand out amongst the prowling ladyboys and friendly streetwalkers of the late Bangkok evenings. Her dresses are always full length and the blouses long-sleeved, revealing little of her figure. On occasion she dons a brown beret. As you approach, she offers up a pleasant smile as she plays and if you linger, will launch into a special selection from her repertoire. Her case sits open at her feet and contains a splattering of coins and crumpled notes tossed in by wandering tourists, few of whom stop to listen for more than a couple minutes. The woman’s name is Cat and she can sometimes be found after 10 p.m. on the corner of Soi 6 & Sukhumvit, below the Nana Skytrain Station. Occasionally I go home that way after a night of playing pool in order to be regaled with Yesterday Once More and Jambalaya (I grew up on the Carpenters) followed by a local song of yearning and loss, which is explained to me afterwards. Sometimes Cat also brings a bamboo flute and I end up singing to strains of Puff the Magic Dragon while the Bangkok traffic rumbles by but a few yards away. It’s a slightly surreal experience, but I appreciate the contrast. If you ever find yourself strolling near Nana Station late some night, keep an eye out for a lonely figure playing a white, garland-tipped violin, serenading the darkness. Stop and listen for a song or two and don’t forget to leave a generous tip — it will be much appreciated and deserved. After twelve months of diligently recording my experiences and impressions in Thailand’s capital city, I’ve decided the time has come to wrap up this blog. In 2015, I plan to launch a new one, possibly focusing on my travels outside of Bangkok. Those of you that are following my efforts (fifty-one and counting!) should get the usual email notifications once I’ve begun. In the meantime, I thank you all for your interest so far. It has involved some hard work, publishing every Sunday, but there was a gratifying sense of accomplishment, which in turn has motivated me to continue my blogging efforts. This entry was posted in 2014, 2014: May---Jun and tagged Bangkok, Sukhumvit. Bookmark the permalink.